C.A. 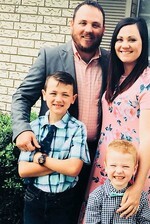 Middleton accepted God’s call to serve as youth pastor here at Lake Athens Baptist Church in January 2018. He is a born and raised Texan and is currently finishing his degree from Boyce College and The Southern Baptist Theological Seminary. C.A. is committed to teaching the truth of God’s Word and holds the Bible as our ultimate standard for truth. He loves teaching our youth about apologetics and shaping their worldview to be built on the foundation God’s word. C.A. and his wife Sara have been married for 13 years and they have two boys, Ian and Beckett. Please be sure to say hello to C.A. and his family. If you have any questions about the student ministry feel free to e-mail or call.